We hope you didn't miss the 2018 Master Gardener Plant Sale! Early birds lined up at the door waiting for the 9am opening. Most plants were sold out by 10:30am. Check out the pictures from the sale. 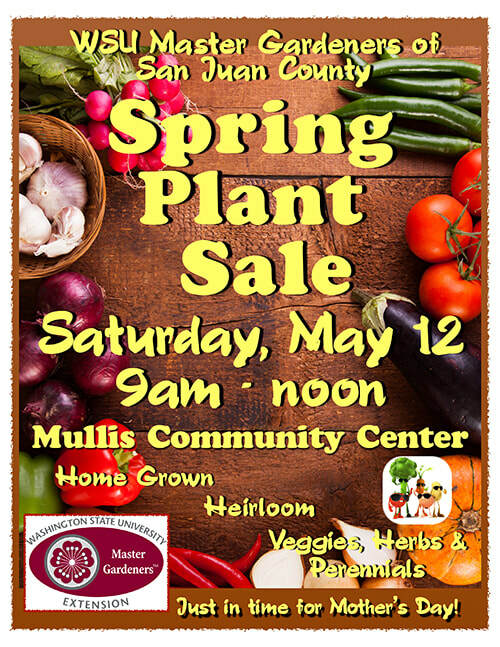 Hundreds of organic vegetable starts and perennials, all lovingly grown and nurtured by San Juan County Master Gardeners, will be on sale at the Mullis Center, Saturday May 12th at 9am – just in time for Mother’s Day! The Master Gardeners choose vegetables they love. They love them because they grow well in our climate, often producing heavily and early; some are unique heirlooms, or serve a variety of uses, but all have exceptional flavor. As in previous years, there’s a large variety of wonderful tomatoes and peppers. ​Peppers plants available range from sweet to hot, for frying, drying, salsas and salads. There are Jalapeno and Serrano for heat, Padrone and Jimmy Nardello for frying, and Anaheim, California Wonder and Corno di Toro’s for eating fresh, stuffing, grilling and roasting. There are cherry tomatoes of all colors, including the favorites, Sun Gold and Sweet Million. There are tomatoes for canning, sauces and drying, and for eating right out of hand. Look for picking and slicing cucumbers, summer and winter squashes and pumpkins, cauliflower, kales, cabbages and broccoli, tomatillos and three kinds of basil. Because these plants succeed in Master Gardener’s gardens, they’re very likely to succeed in yours. Master Gardeners will be at the sale to provide care and growing advice. There are over 600 perennial plants this year, including natives, with plants suited to many types of garden environments: groundcovers, flowers, ornamental grasses, small shrubs, and wonderfully unique accent plants to pop into a special spot. If you’re an Iris lover, you’re in luck – there are dozens, representing five different species. Other dependable favorite flowers include Daylilies, Geraniums, Alstroemeria, Bunchberry, “Wood’s Blue” Aster, Yarrow, Muscari, and Lavender. The full list of perennials is much longer. All proceeds from the sale are used to support Master Gardener programs such as the Demonstration Garden at the Mullis Center and this sale. Last year the Demonstration Garden provided over 1,500 pounds of produce for the Food Bank. Funds also support plant Diagnostic Clinics on Lopez, Orcas and San Juan Islands.